A majority of the parenting decisions I make are based off how I was raised. It's my first line of defense and utmost point of reference ... what would my parents do? I have zero complaints of my childhood. Sure, I didn't have cable or even a microwave. I had to do chores. I never went to Disney World. I had to be in choir in order to play sports. I had dinner every single night of the week at the table with my parents and brother. I wrote thank you's, I was told NO a lot, I earned every pair of Nikes and Abercrombie jeans I owned. And, I had to be nine years old to get my ears pierced. It's what my Mom said. And when I incessantly whined about the injustice of her math, she told me she had to be 13- that was her Mama's rule. 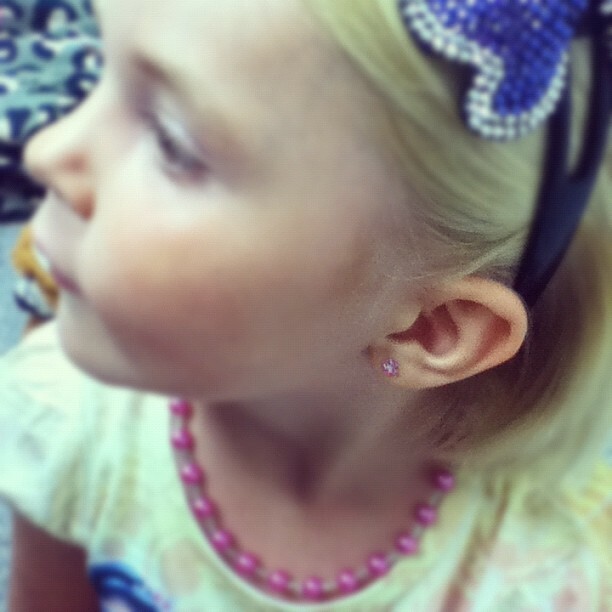 So when my daughter started inquiring as to when she could get her ears pierced a few years ago (yes, she was barely two; using little adhesive gemstones to her ears as jewelry) I told her she had to be much older. Probably nine. She didn't even know what that meant. The Dad overheard this and scoffed at my rule and assumed when his baby girl was good and ready, he'd take her to the Piercing Pagoda to get her first piercings done. Well, his baby girl was good and ready yesterday. At the tender age of four point five. It doesn't surprise me, her perseverance to want real earrings. She wears gaudy, painful plastic clip-ons most days of the week along with her standard headband, necklace, anklet, and bracelets. And hats and sunglasses and tiny purses filled with spare accessories for costume changes at whim. And the LAUNDRY I do to keep her in three, ruffly, flouncy, glittery, blingy outfits a day ... I am raising a girl. So while my Grandma started the trend of reaching a certain age to experience ear piercing as a rite of passage, it was the next generation who broke the rules. That's part of parenting, knowing where you came from, appreciating the tradition, and upholding rule. And then breaking it. I whispered to my now much bigger girl yesterday, "in 14 years you can pierce your nose!" And she looked at me like I was crazy. I'm sure her grandma and great-grandma would agree. That's the best part of parenting, after all.